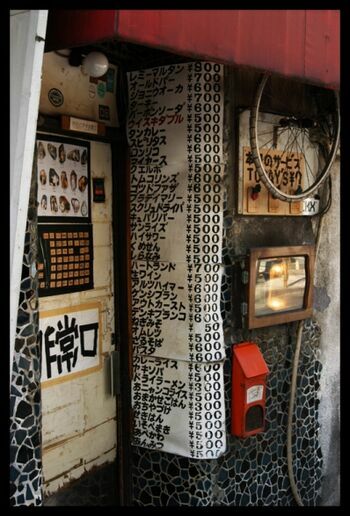 This bar menu in Shinjuku, Tokyo, lists food and drink in both angular katakana - for loanwords or to make signs easier to read - and the curvy hiragana script - for native vocabulary. Photo © by Sonny Santos, used by permission. Japanese employs three scripts in its writing system, one of which is カタカナ katakana, which represents the moras of Japanese (units similar to syllables). These developed from Chinese-derived characters called kanji, but were simplified in form and stripped of their meaning. For example, チ comes from the kanji 千 chi, meaning 'thousand'; the katakana symbol is pronounced in the same way. Katakana is used for several purposes in modern Japanese, and also had other uses in the past. One main use of katakana is for writing new vocabulary: words that have been borrowed from other languages are usually not written in Chinese-derived characters (kanji) but phonologically in katakana. As characters usually indicate a meaning as well as a pronunciation, it can be difficult to select a combination of characters to represent a new word or phrase, and some sounds, such as di, have no characters that are read using those pronunciations. In addition, use of katakana allows an approximation of the original word's pronunciation to be retained. Japanese has incorporated a vast number of foreign words and phrases into its lexicon, often changing the meanings and abbreviating them in the process, and users also commonly make up expressions which do not exist in the original language (和製英語 wasei-eigo, for example, is literally 'made-in-Japan English'). Frequently, being written in katakana is the only clue that these words are of foreign origin. For example, オエル oeru is derived from the English pronunciation of the letter sequence 'O.L. ', short for office lady, which in turn is wasei-eigo for 'female office worker'. バイト baito is from German arbeit 'work', but in Japanese means 'part-time job'. Other are more recognisable: コミュニケーション komyunikeeshon is 'communication', and ホテル hoteru is 'hotel'. 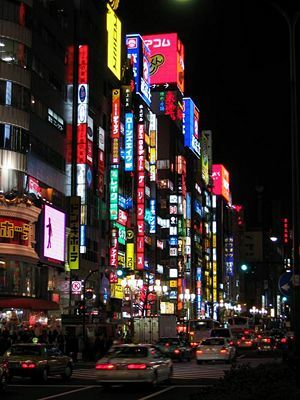 Neon signs light up the streets of Shinjuku, Tokyo. Logos and other signs often employ the katakana script rather than kanji characters. Katakana has been further adapted to allow sound sequences that are not part of native Japanese: for example, di does not exist in native vocabulary, only in loanwords. In this case, デ de and a small イ i are used to indicate [di] instead, allowing words such as ディスク disuku 'disc'; older speakers might pronounce this with ji instead. Katakana is also used for native Japanese words from time to time, especially company logos on the streets, and for onomatopoeic expressions (e.g. in manga). It also serves the same purpose as bolding or italics in other orthographies, i.e. to highlight words and phrases, and sometimes when the pronunciation of a kanji is explicitly written. Finally, some words are usually or always written in katakana anyway, especially some people's names. This was particularly common for female names until the mid-twentieth century - a name such as Mitsuko, for instance, might be written as ミツ子, with only the -ko ending in kanji. Other words, particularly grammatical particles, are written in another mora-based script, ひらがな hiragana. In the past, these scripts were more widely used, and so today there are many words in Japanese that have no kanji assigned to them, or for which the characters are little-used:　綺麗 kirei 'pretty' or 'clean' is usually written in hiragana. Both scripts developed through simplification of Chinese characters and elimination of their meaningful components, so that kana would become phonological alone. Some words vary according to use or user as to whether they are written in hiragana, katakana or even kanji: e.g. 熊 kuma 'bear' can also be written in hiragana or katakana as くま or クマ. This page was last modified 02:27, 12 January 2013.